Your photo of a no-name-brand Chinese power supply does not show any specifications and does not show its schematic and parts list. The photo shows its 30VDC output when its current is zero. The defective Greek kit and Chinese copies do that but cannot produce 30VDC at 3A. Instead they produce about 25VDC with a lot of ripple at 2.5A and the parts are burning. I found this. Since the same model number is shared by other 4 brands. 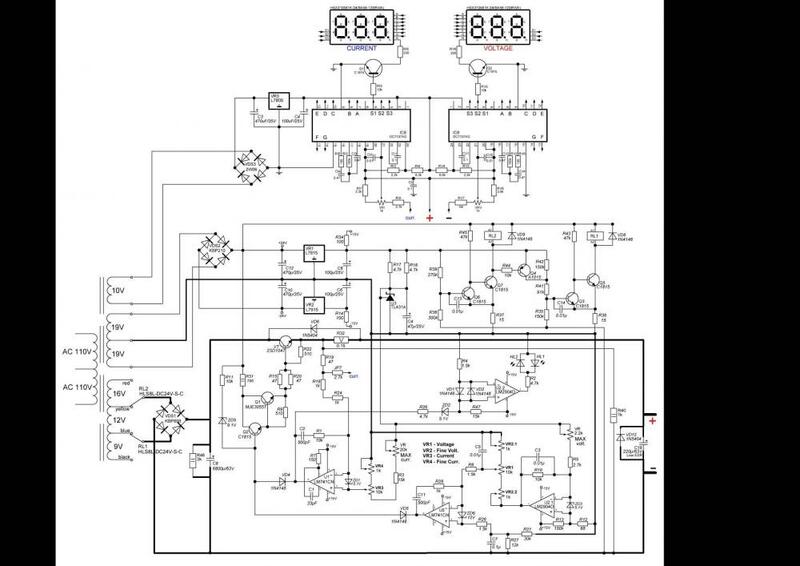 I can't tell if the actual hardware still true to the schematic. The Chinese power supply uses relays to switch the transformer voltage into voltage ranges so that the output transistor does not get too hot. I do not know if any parts are overloaded and I do not know how good or bad is its regulation. Its LM741 opamps were designed 50 years ago (!). I will choose this project in that case. I made this 30v lab supply using mc34072 and everything is working fine except the voltage at output is not.going below 15mv as it should go to 0 and the current limit is not working below 36ma as the current limit should work till 2ma as stated, please help. My concern is that ,1- voltage should go to zero which is not going and is about to 15mv whe voltage pot turned to zero. 2-current limit is working till only 36ma and not below it.. Please i appreciate any help..
Every opamp has an input offset voltage error. Single opamps like the recommended MC34071 and the TLE2141 have input offset voltage adjustment pins. The project uses trimpot RV1 to null the offset voltage but your MC34072 does not have offset adjustment pins. Since your MC34072 has two opamps then it has double the heating and I think it becomes too hot. What is the consensus about the voltage spikes discussed on older posts? REV8 adds a darlington transistor to solve this problem. But even after that, other solutions are still being presented for the same problem. I have a 30V, 8A transformer. Will this do the job. I want to make this project on Breadboard for professional purpose. Is it possible ? A solderless breadboard has intermittent contacts that cannot handle the high currents of this project. The many rows of contacts and wires all over the place have capacitance between them that frequently causes a circuit like in this project to oscillate at a high frequency. In my career I made all my prototypes soldered together on stripboard where I planned the layout to be compact and the strips were cut to length so that each strip was used for many parts of the circuit. Some of the circuits were very complex but worked perfectly and looked good enough to be sold as the final professional product. Thanks audioguru for your endless effort to the fulfillment of passion . 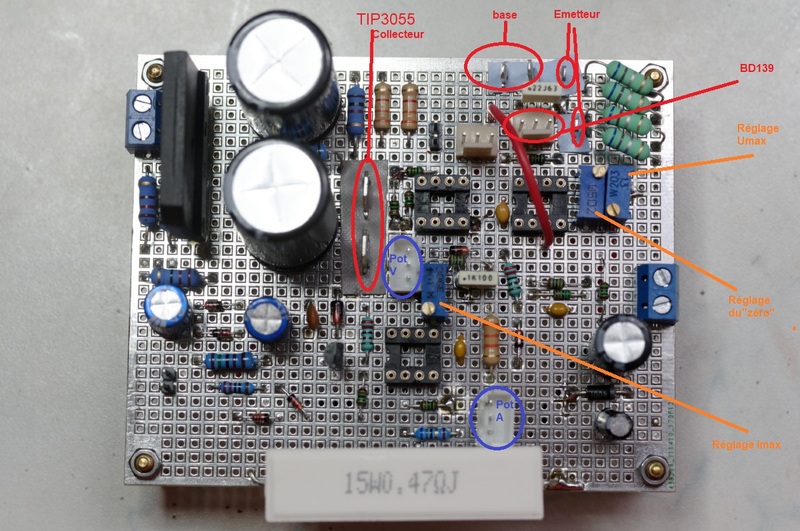 Can i use 30V, 8A transformer for the Project of " 0-30V PSU Rev-7, 14-Aug-2014 Latest By Guest-liquibyte ". 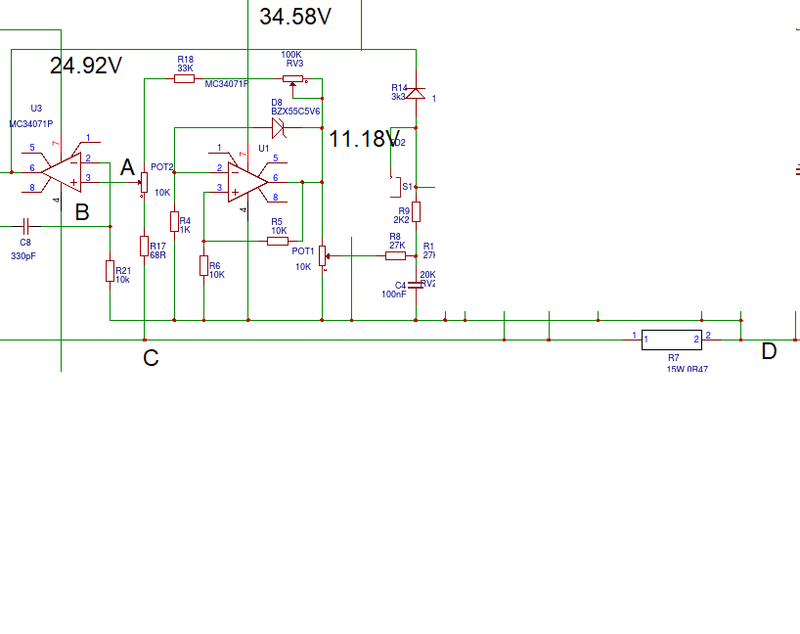 Hello, I make a PCB with this schematic, with a 24VAC transformer, who give normally 36VDC after main capacitor. -The voltage start to 36VDC and grow up to 44VDC and stabilize. -After inspection, I remove R1 (in my schematic R1 1K+R1-1 1k2) and I have 36VDC, ok.
-I put a 1K resistor for R1 (R1+R-1) and I have 36VDC for testing. -I I remove R1(R1+R-1) and I have 44VDC !!! What is the explanation of this ? This project will not produce 30.0VDC at 3.0A with a 24V transformer. It might produce 25VDC at 2A with a lot of unregulated ripple.The transformer must be 28VAC or 30VAC at 4.2A. A 24V transformer will produce about 25VDC when it has a small load current which has a peak of 25V x 1.414= +35.4V and the bridge rectifier reduces it to about +34.0V. Maybe your transformer is cheap and has a small maximum current so it is made to produce a much higher voltage when it has a small load current (your 2.2k resistors) then its voltage drops when it is loaded with your 1k resistor. Or maybe your meter is measuring the AC ripple that is caused by the value of the total capacitance of C1 is too small. Hi : I am not sure if you understand my problem : I measure Voltage on the PCB without AOPs and Transistor, to make sure all is ok before put the AOPs. The voltage I give is on The collector of TIP3055, just after the KBK. Ok, finally I replace R1et R1-1 (1K+1K2) by two 2k2 1W in // and it's works very well. The first test are pretty good. If you want I made a final review when I will finish my Power supply . Thanks audioguru for your answer ! I would be perfect if you share your review building this PSU with other members on the community. Now you say you measured 27VAC from your 24V transformer when its load current is low. Then it is cheap and has a high resistance so they made its voltage 27VAC instead of if it had low resistance and an output closer to 24VAC. Or maybe the voltage of your AC electricity is higher than normal. The peak of 27VAC is 27V x 1.414= 38.2V and the full wave rectifier drops it to about 36.8VDC, not 44VDC. You are right with the fact with 27VAV => 44VDC after bridge rectifier is not normal, even without a charge. -and so, if my hypothesis was good, we have to find why and where is the new "zero point"
My point of view is, even it's working well with a charge >25mA, I would want to know (because of my scientist brain) the cause of this fealure, in order to not make the same error the next time ! Which schematic are you using? Years ago when I replaced the low voltage TL081 opamps with higher voltage MC34071 or TLE2141 I replaced the D7 zener diode with two diodes so that the negative supply is only -1.3V. The 0V reference (zero point) for making measurements has always been the negative wire of C1, the main filter capacitor. I made a lot of test yesterday and it's works fine, i.e it could deliver 3A <20V, 2.5A<24V and 1A to 30V. 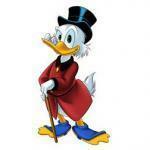 It's ok for me, I thinks what did you say and maybe I will buy a 28VAC 160VA toroïdal transformer. So I test for ripple voltage for 5V 1-2-3A, and it was pretty good. I test start and my "disable output" and the results were good, particularly the limitation of current peak. Well finally I test de current limit function, and, after adjusting trimmer RV3 for 1.41V (max 3A), when I make a short-circuit with the Potentiometer 10K at full the current go up to 6A and it blows up my primary fuse (630mA). 1)Ok, I replace the fuse, and I wonder why the max current is 6A ! 3) I test with my multimeter and it is not 5V but 3.90V with 0.390mA ! a) Why with the pot2 to max and with RV3 for 1.41V or even to make it at fully (100K), the current limiter is over 6A ! b)Why now the voltage regulation go down with a small charge, go 5V=>3.90V with only a 10R Power resistor. It's the same with 10V=>7.5V and 8V=>6.90V for example. c)Why the chineese digital multimeter see 5V and not 3.90V ? I test with other and it was the same things. 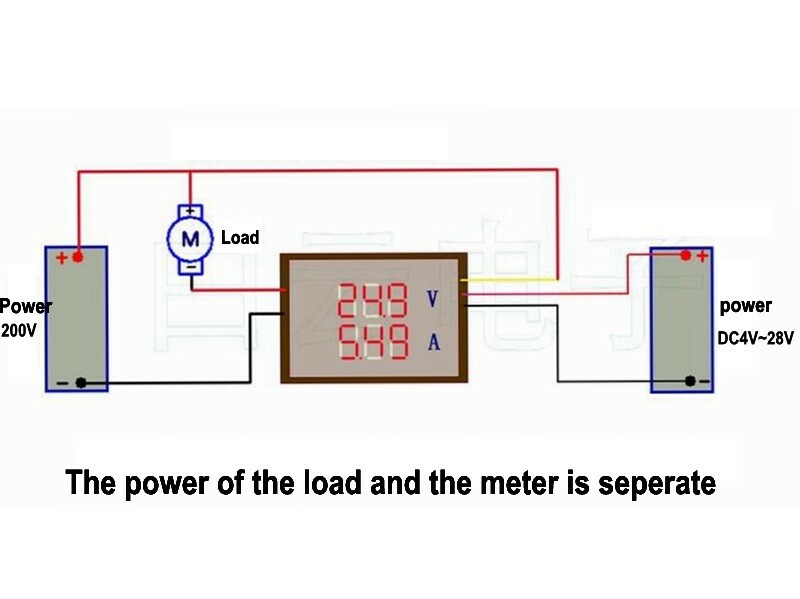 Or yesterday when i make test, when I put a 2A load on 30VDC the chineese meter saw the same fall than my Multimeter, so why now it did not see the voltage fall ? I Checked AOPs, Transistors and voltage on AOP, main capacitor, and all is fine. I give you my schematic and how the digital meter is plugged. The Chinese meter is messing up the voltage and current of the power supply project. Try the power supply project without the Chinese meter. Measure the voltage across R7 then calculate the current in it. The voltage across R7 will never be more than 1.414V when the current in it is 3.0A or less. When you write on shematic +1.41V above R21, it is between Circuit OV, not the output ? I wonder if the ground have to be before or after R7 ? Is there any importance ? Oh I measure without my my chineese multimeter and so I have 3.90V on the 10R charge load. I decided to measure voltage directly on the output of the PCB and surprise I have 5V ! So I think It was the cable between the negative output and the banana-plug who make this voltage fall ! Sorry for this disturbance, I will say you if this is it or not ! 5V on 10 ohms produces a current of 500mA (0.5A). Then the voltage across R7 is 0.235V. 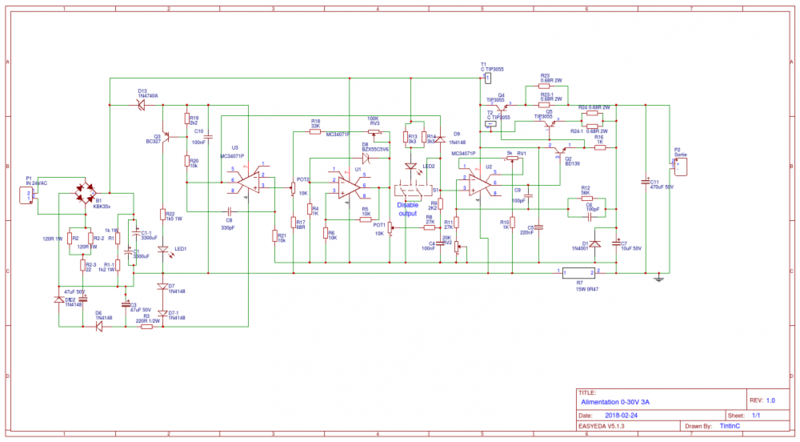 On your schematic, C is the ground for the current regulator. The output ground is its input signal and the 11.2V is its reference voltage.